UPDATE: I fixed some of the over-exposed images and edited some others... the updated set is here. The original (unedited) set is here. 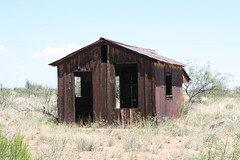 Today my daughter Elizabeth and I went exploring ghost towns in Cochise County, Arizona. We began in Pearce, Arizona. There are still people living in Pearce, although many ruins are visible. The cemetery has people in it who were buried as recently as 1980. It is pretty well maintained. From Pearce, we took the Ghost Town Trail (a partially-paved-mostly-dirt-road) to Courtland, Gleeson (not much to see in either location) and then to State Road 80. From there we went south to Bisbee, which is not a ghost town but an eclectic, artsy town near the Mexico border. On our way back to Tucson we got stopped by a Border Patrol checkpoint. We passed and were allowed to proceed. When you click the images, you can see the geotag information and know where the picture was taken. I achieved this by running a program called GPS Tracker on my Blackberry. GPS Tracker uploads to a website called Instamapper. When I got home, I ran a program on my Mac called GPSPhotolLinker. This program imports the .GPX file created by GPS Tracker and matches the geotag date and time info with the date and time on the image. It's a nifty way to know where you were when you took the picture. It was a cool experience. We saw a lot of history. I am a little disappointed that the pictures are a bit over-exposed, but I'm going to see if I can bring out some more of the blue sky in iPhoto or Photoshop Elements. Advice is welcome! Because I'm on a roll, I uploaded another set of ghost town pictures - these are from Frisco, Utah in 1997. Glad you had a good time in the Pearce area! If you are still around... come see us at the Sunsites Farmers Market on the grassy lawn in front of the Shadow Mountain Golf Course, today, Saturday 8 to noon. Check us out & vote for us at sunsitesgolf.org!